Finally I now have a chance to update this blog; it’s been hard to find the time and internet connections are few and far between. Alaska has been an exceptional experience and having made it into Canada, I’m able to reflect on how good it’s really been. Long winding mountainous roads passing through exceptional scenery, I’ve run out of superlatives to describe it; the wide shoulders and virtually non-existent traffic make it difficult to beat as an all round cycling experience. 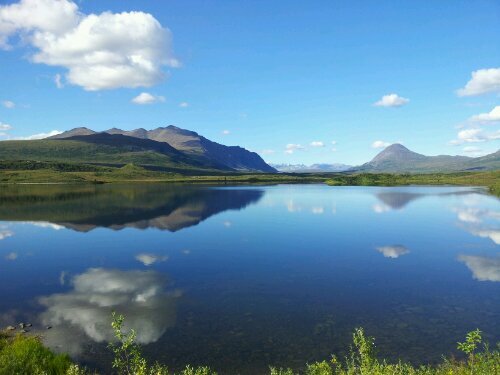 I’d recommend it to anyone considering such a trip, but preparation is essential as well as the mindset to deal with a significant amount of hardship (mosquitos, bears, cold, gruelling hills and distances, wet weather etc). Having had a glimpse into what it’d would be like to have company, it was a tough moment to part ways and I was touched by their eagerness to help. With a temporary fix to my mechanical failure, I cycled on that night till 4 a.m. a safe campsite was hard to find and I was exhausted. Then there was Brian and Beaux on the Denali ‘Highway’, owners of Alaska Raft Connections; they’ll organise everything for you including route and kit so you can make your own self-guided trip. Apparently that’s the way things are heading these days; people prefer to do their own thing without the constraints of a guide, I can relate to that. After patiently listening to my stories, they loaded me up with granola / muesli bars and water. 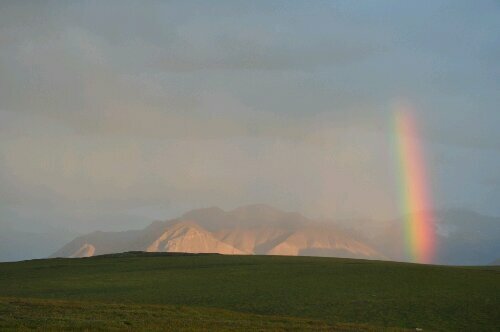 Kindness in Alaska was not unusual; maybe living in such a wild and beautiful place does something to the human spirit. 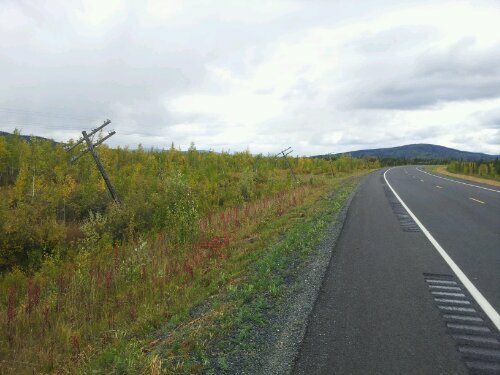 It also does something to the telegraph poles; this taken just before the Canadian border (as a result of permafrost I’m told), they ran along the road like this for several miles. Then there was the bear attack. Why did it happen? 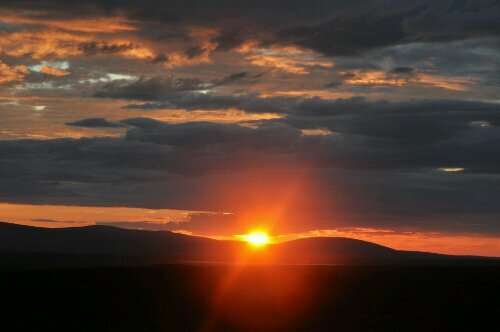 I’ve had some ideas and further insights as I’ve learned more, spending time in this wild and unforgiving environment. Hopefully I’ll get a chance to put this in a future post. 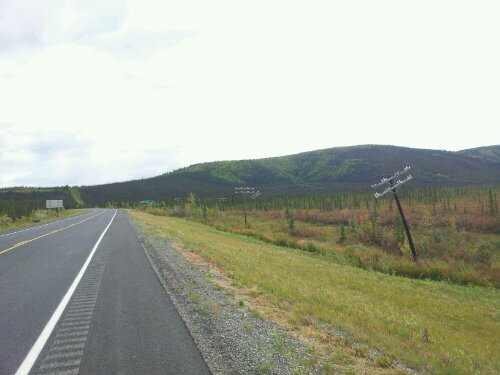 In summary, for anyone contemplating a trip out to Alaska, the cycling highlights for me were the Dalton Highway, Denali National Park, Denali Highway and Kenai Peninsula (mountain biking trails). All very unique adventures and unforgettable experiences, memories I’ll treasure for the rest of my life. Great blogging, Shackleton. The trip sounds awesome and everything you hoped it would be. Please try not miss your office job too much. .
Looks like its been an amazing trip so far buddy. Looking forward to reading about the next stage! Cheers Sam, good to hear from you. Greetings Nick from Brian & Beaux of Alaska Raft Connection! Was very cool to meet you on the Denali Highway before the Mclaren Summit climb. Glad the weather was cooperative for this stretch! My hat is off to ya, as I do Snowmobile tours in wintertime on this unmaintained seasonal highway… this being the origin to several river systems I raft or Kayak that course various directions entering the Yukon in two distinctively different places, the Cook Inlet, and Prince William Sound. Pleased to here the H2O supply and energy bars provided fuel for the peddles and mental fitness. Hope to see you again one day. Not sure as of this moment how to put pics in my commentary… I can always email. Brian & Beaux 🙂 We’ll be following your trip on here – email anytime! you were doing repairs to your bike, i.e. gear setup or whatnot. Suggested to take you to Hazelton but you declined. Left you then,(Sep.8th) and hope you have fared well since then. Shall follow your travel adventures with interest. Prince Rupert,B.C. (Canada) Sep. 11th, 2012. >>>>>if we happen to pass you again, twill be by car as left the RV behind in Pr. Rupert, to where we returned after a wheel mishap. highway 16 (Yellowhead) offers Mt. Robson, eventually Jasper etc. Ripe fruit now in the Okanagan valley etc… warmer also. Big lake ! 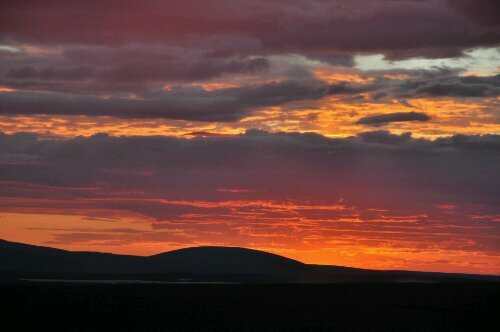 Anyway….. BON VOYAGE and soon the sun will shine again and that tent might dry out.